One of Green Prophet’s most-read stories was our article on sugar-waxing, an ancient method of hair removal that predates waxing. What is it about body hair that makes for riveting reading? Come learn what I’ve picked up about dealing with body hair in the Arab Middle East. (Feedback welcome: I’ve been knocking around the region for four years, happy to hear if I’m presenting “fake news”! Humans first started removing hair from men’s faces, most likely for cleanliness, and the first “razors” were rock blades made of flint. Shaving got a boost by Alexander the Great who required his soldiers to be beardless in battle so as to gain an advantage in hand-to-hand combat. Many contemporary militaries still follow this practice. Egyptians are also credited with inventing sugaring, believed to predate shaving. It’s similar to waxing, but uses a sugar-syrup paste that gets spread onto skin. When the mixture cools, it’s quickly peeled off, yanking hair out at the roots. Hair removal by “threading” started in India 6,000 years ago using thin cotton thread to wrap and tug hair out in a rapid rolling motion. Called fatlah or khite in Arabic, Middle Eastern men and women both partake as a method to highly define brow shape. 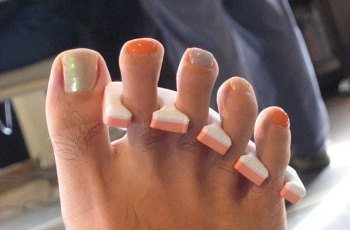 Fingers and toes also get plucked as part of the routine regime in most gender-segregated beauty salons. Below-the-chin hairlessness now seems the norm for women, while men tend towards judicious man-scaping. If you’re dealing with a forest of fur (see our lead image), electrolysis may be the answer. Performed by licensed technicians, a needle-like probe is inserted into each individual hair follicle, zaps it with heat or chemicals, and the hair is removed with tweezers. Multiple treatments are needed, but your hair will be history. To grow a beard or shave? Most Islamic scholars agree that the mustache should be trimmed to ensure hygienic practice so the hair does not touch the lip, and that beards are kept at an appropriate length, which is generally a fist length. According to Islamic scholars, there are only several kinds of head shaving that are permissible: when performing Hajj, Umrah, shaving a child’s head on the seventh day after birth, when a man converts to Islam, and shaving the head as a remedy for disease. Women are not permitted to shave their heads or eyebrows, but everything else is fair game including the pubic region, armpit and forearm hair, and thighs, Curiously, removing a unibrow is permissible as it is not exactly part of the eyebrows. When showing the above image to local Arab men in Aqaba, Jordan, they didn’t see the gorgeous face, instead recoiled from the naturally hairy arms! It is widely advised for Muslim men and women to remove pubic hair and armpit hair as a way to remain clean; pubic hair is shaved with a razor, while armpit hair is tweezed (ouch! ), but what matters is the removal, and in modern times depilatory substances are permissible. In an increasingly challenging sociopolitical and geopolitical climate, the symbols and meanings attached to fatwas are rapidly changing. Which hair removal method you choose and on which part of your body seems less important in comparison to very real and pressing issues the Muslim world is facing.